Since breaking into the American mass market more than 50 years ago, yogurt has evolved variously with consumer tastes; it’s been dyed, sweetened, lightened, liquidized, mixed with fruit, honey, and candy, and even squeezed into portable plastic tubes. But few iterations can be said to have experienced a more meteoric rise that that of Greek yogurt. Indeed, the Greek yogurt market in the U.S. has undergone a growth spurt that a recent Wall Street Journal article called “nothing short of astronomical.” While sales five years ago amounted to a mere $60 million annually, today they represent nearly a quarter of the $6.8 billion spent on yogurt in the U.S. every year. According to a UBS report released in March, the two leading Greek yogurt brands—Chobani and Fage—now account, respectively, for 9 and 4 percent of the overall yogurt market. American bigwigs Dannon and Yoplait have suddenly found themselves on their heels; both launched national advertising campaigns this month for their Greek yogurt products. 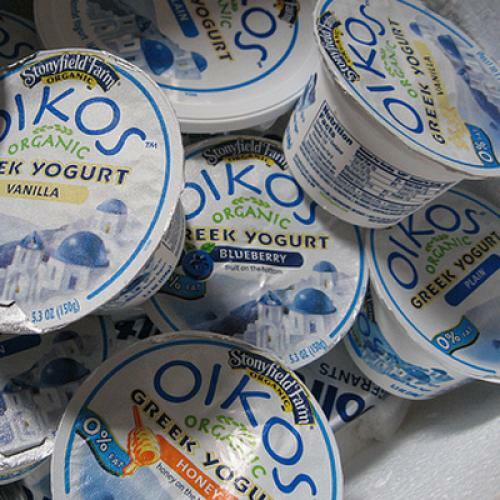 How has Greek yogurt, virtually unknown just a few years ago, suddenly become the snack du jour in the U.S.? And what does its fantastic rise say about us? Greek yogurt’s basic appeal, for those who have tried it, seems fairly obvious: It’s both tasty and relatively good for you, filling but not too fatty. Low- and non-fat varieties retain the yogurt’s signature thickness, which results from a centuries-old technique of straining out liquid whey. Though regular American varieties of yogurt have less protein and tend to be soupier, they do have the advantage of being less expensive. The UBS report explains that Greek yogurt sales have nonetheless soared on the backs of upper-income, highly educated consumers—particularly women—who are willing to pay a few extra bucks for an affordable, healthful indulgence. The question of precisely how and when the product first made its way to the U.S., however, remains uncertain. At least one person, Kostas Mastoras, claims to have been the first to import and sell Greek yogurt in the States, more than 20 years ago. Mastoras, the owner of Titan Foods, a Greek food market in Queens, New York, told me that, in 1988, he traveled to his native Greece to buy feta cheese from Fage. At the company’s headquarters in Athens, a manager suggested that he take back a small shipment of yogurt as well, and Mastoras obliged. He says he didn’t expect his customers to like the product, but soon it was so popular that his food distribution company, Optima Food, began selling the yogurt to grocery stores throughout Manhattan. Panos Mourdoukoutas, an economics professor at Long Island University and Mastoras’s longtime friend from Greece, says the booming economy of the 1990s meant consumers were willing to pay the extra cost for Greek yogurt. New York’s Greek yogurt-buying population, in turn, was large enough to create a “tipping point,” allowing the product to take hold more widely. Mastoras says he also worked with Fage to market the yogurt by showcasing it at food exhibits. A representative from the company, Russell Evans, told me that he couldn’t say for sure whether Mastoras had been the first to import Fage’s yogurt, but that he was at least among the earliest sellers and distributors of the product. In any case, Fage soon established a subsidiary in the U.S. in 2004, Evans said, and opened its own plant in upstate New York in 2008. Chobani, meanwhile, bought its current factory, also in upstate New York, in 2007 from Kraft—a facility large enough to allow for mass distribution of Greek yogurt nationwide. Whether Mastoras can truly take credit for the start of the Greek yogurt boom is unclear. But beyond this one-man tale, four anthropology and history professors with whom I spoke said the rise of Greek yogurt in the U.S. reflects a larger change in the American culinary consciousness: a desire for foods that are considered purer, simpler, and more natural—in other words, not yogurts purporting to taste like key lime pie or strawberry cheesecake. The trend is in line with the rise of farmers markets and the slow and local food movements, says Yale professor Paul Freedman, who studies the history of food and edited the anthology Food: The History of Taste. Hence the success of a product with roots in the West’s oldest major civilization—and a land many Americans imagine to be populated by “good, solid farm folk,” as Ted Bestor, chair of Harvard’s anthropology department, put it to me. Indeed, for better or for worse, Greek yogurt’s popularity may be due, at least in part, to certain stereotypes about the country and its cuisine. According to Michael Herzfeld, an anthropologist at Harvard who specializes in Greek culture, one of the reasons for the popularity of Greek yogurt is that Americans are likely to assume that it fits into the context of the Mediterranean diet, alongside low-cholesterol foods such as olive oil, nuts, and fish. But this association is mistaken, says Herzfeld, who calls the notion of a low-fat Mediterranean diet “a piece of historical nonsense.” Herzfeld spent eleven years living and doing research in Greece, and, for 16 months, he stayed in a village in the mountains of central-western Crete, where one of the most common dishes was “very fatty” boiled mutton—and where yogurt was likewise very high in fat. Margy Slattery is an intern at The New Republic.